Spyker is targeting U.S. drivers by offering an automatic transmission on the C8 Aileron, pictured. AMSTERDAM (Bloomberg) -- Spyker Cars NV, the Dutch supercar maker that acquired Sweden's Saab Automobile, aims to raise annual vehicle sales sevenfold in two years with the new 198,000-euro ($240,000) C8 Aileron model. Spyker is targeting deliveries of 250 C8 Ailerons in 2012, Peter van Rooy, the company's sales manager, said in an interview at the manufacturer's headquarters in Zeewolde, Netherlands. 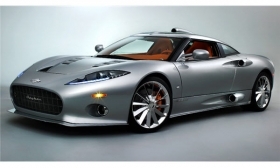 Spyker sold 36 cars last year and has delivered a total of 214 vehicles since 2002. The expansion contrasts with plans by Fiat S.p.A.'s Ferrari brand to keep production at 2009 levels and eliminate jobs. Spyker is reducing the cost of making the C8 Aileron by shifting production to supplier CAPP Manufacturing Ltd. in Coventry, England, while targeting U.S. drivers by offering an automatic transmission, Van Rooy said. Spyker rose as much as 79 cents, or 2.9 percent, to 2.83 euros as of 11:27 a.m. in Amsterdam trading. The stock has gained 33 percent in 2010, valuing Spyker at 59.6 million euros. The first C8 Aileron delivered will be a tailor-made, 260,000-euro silver-and-white model with turquoise leather seats, to be handed over in late July to a Russian billionaire, Van Rooy said, declining to identify the buyer. The model's automatic-transmission option will be key to winning over American, Russian, Chinese and Middle Eastern drivers, who favor the technology over the manual version, Van Rooy said. The company didn't offer automatic gearboxes in previous models, he said. Shifting C8 Aileron production to Coventry from Zeewolde in November 2009 helped Spyker reduce the time needed to build a car to 275 work-hours from more than 500 hours previously, he said. Spyker may also add 80 mechanics in Coventry. Spyker's peak production and sales year was 2006, when it built 94 cars and sold 74, according to its annual report. That compares with the 6,000 cars that Modena, Italy-based Ferrari made last year and the 4,616 vehicles that Volkswagen AG's Bentley super-luxury brand delivered in 2009. The current C8 Spyder and C8 Lavallette models, which are built at Spyker's headquarters plant, will be “phased out slowly,” Van Rooy said. The company's sales predictions don't include Saab, which remains a separate brand. Spyker was co-founded in 1999 by CEO Victor Muller, who bought and revived the 100-year-old Dutch brand to develop supercars, or sports cars costing more than 100,000 euros. Spyker, which held its initial public offering in May 2004, has been unprofitable since at least 2001. The company aims to post a profit in 2012, Van Rooy said.